Just cannot believe what happened yesterday! Went fishing before work at one of my new favorite fishing spots. (reservoir) I like to start my day on the lake with a cup of hot coffee and read a fishing devotional and just chill before I start casting. As I was sipping my coffee and getting my devotional book out of my backpack I noticed a fish had risen (bass probably) for some surface food and had created a riffle that was heading towards me on shore. As I opened the book to the chapter I was on, it was entitled "The Ripple Effect'. Imagine that! It had to do with decisions we make, usually wrong ones, that have ripple effects on people for years. So the morning started out very nicely. Then I started to cast with my 6" Green Pumpkin worm and this guy latches on. I was stunned t say the least. I am relatively new to bass fishing and absolutely love it! I was so excited I forgot to measure it before he was released but he is bigger than the 18 1/2 inch one I got a while back in a pond. God sure is good! Beautiful fish - I gotta get me one of those books! 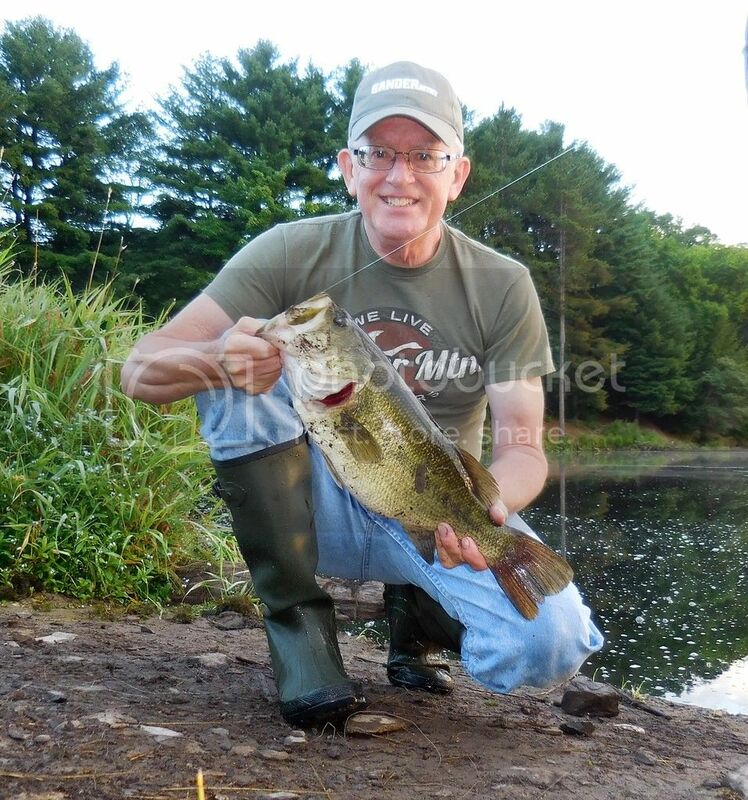 Yari - congrats on the smallie too - a 16" bronzeback is a lot of fun. I agree with you on most of your post, especially where you said, "God sure is good! ", but the part about releasing the fish, that bothered me ! The 2 filets and the back bone would have made a great meal! Been eatin' these Florida bass for close to 70 years and they have all been delicious, everyone of 'em . Congrats Bearclaw. That is a dandy. I love to catch those bass, but if i am after eating fish, i go for crappies! Hope you catch a boatfull more!! Very good morning Bear!!! Nice Bass!!! Congrats on the nice bass. God is good, indeed!